Don’t Drink the Kool-Aid, Superman!!! Continuing my on-going series of Photoshop creations, I have another fake Kool-Aid packet for you. 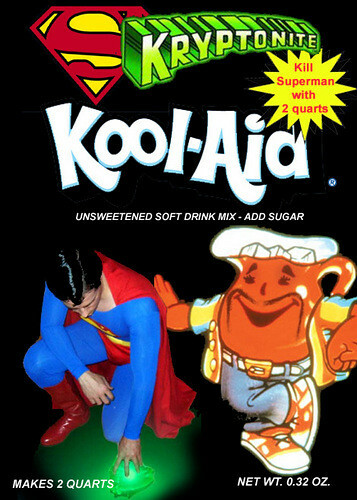 For the budding evil genius in all of us, I present Kryptonite Kool-Aid. I created this around the time Superman Returns was released in theaters. If this seems familiar, it was mentioned in an earlier article on this blog. Check out my other Kool-Aid creations here. This entry was posted on February 22, 2007 at 1:54 pm and is filed under humor, Kool Aid, Photoshop, pop culture, Superman with tags Kool Aid, Photoshop, Superman. You can follow any responses to this entry through the RSS 2.0 feed. You can leave a response, or trackback from your own site. Nice blog you’ve got here. Cheers! Obviously I enjoy Kool-Aid too, otherwise I wouldn’t bother making my own flavor packets.